Shrimp are small but mighty! They have a high nutrient density and plenty of protein in a small serving. Just 4 ounces of shrimp provides 23 grams of protein (almost half of your daily value!) in just 112 calories and less than a gram of fat. They are also a great source of selenium and vitamin B12 (see WHFoods). When served with other nutrient-packed foods like spinach, avocado, and tomatoes, you have yourself a powerful salad! 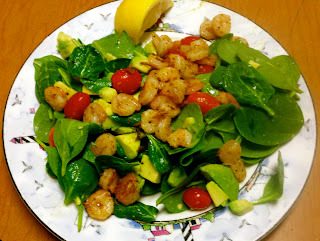 This cajun shrimp salad is one of my favorites for lunch. Heat oil over low heat in a medium saucepan. Thaw shrimp according to package directions if frozen. Add shrimp and cajun seasoning to saucepan and heat for about 5 minutes (shrimp should already be cooked). Meanwhile, cut open and chop the avocado to bite size pieces. You can also cut the grape tomatoes in half, if desired. Once shrimp are heated, mix together all ingredients in a large bowl and drizzle with lemon juice. Add salt and pepper to taste and serve! Bringing the total to $16.58 for four days of lunch or $4.14 per serving. (I didn't include the oil and spices because those are cupboard staples and can be reused for other meals). Now that's a cheap nutrient-packed meal!